We travelled to the northern part of Sweden (Umeå). It’s a long trip, 14 hours by go train. We took the night train. That’s exotic. You realize that Sweden is a long and quite large country. You leave in one end of Sweden, sleep an entire night and wake up in a totally different part of country. When we opened our eyes (with help from the conductor) 5.30 in the morning it was in a snowy, frosty landscape. Everything was frozen and wrapped in snow. 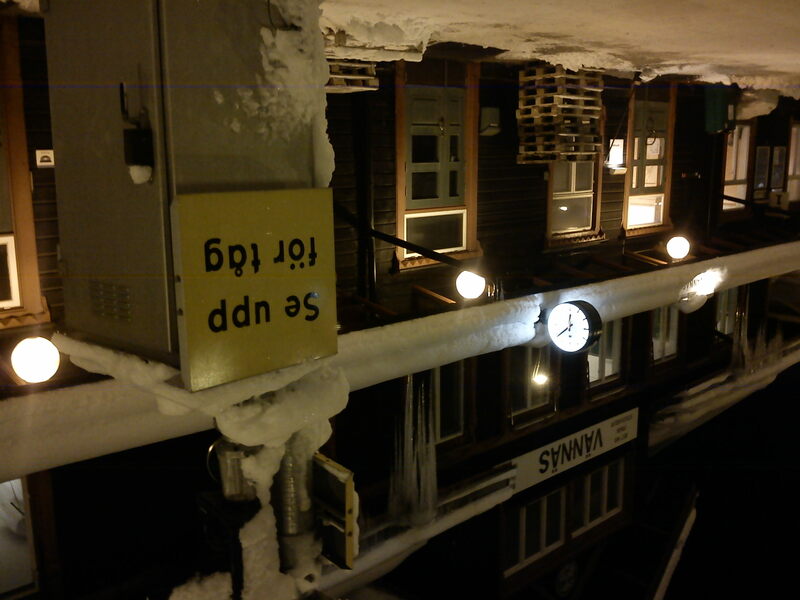 We had to change from train to bus in Vännäs when we saw this old wooden train station. Just beautiful. We crossed the tracks (the sign reads: watch out for trains), took a good look at the house, and continued our journey in a frozen landscape. This is winter in the north.